Summertime means running barefoot through sprinklers, nibbling fresh fruit, and shining your smile all the time, even when you’re sleeping. It means laying your back, watching bubbles of clouds dot through the sky. And today we’re eating one such cloud. 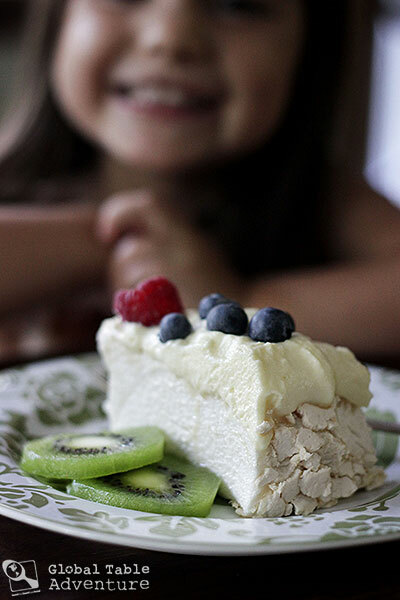 Named after a Russian ballet dancer, this meringue “cake” takes center stage, topped with whipped cream and fresh fruit, like berries, kiwifruit, mango, or even passionfruit. Both New Zealand and Australia lay claim to inventing this famous dessert. 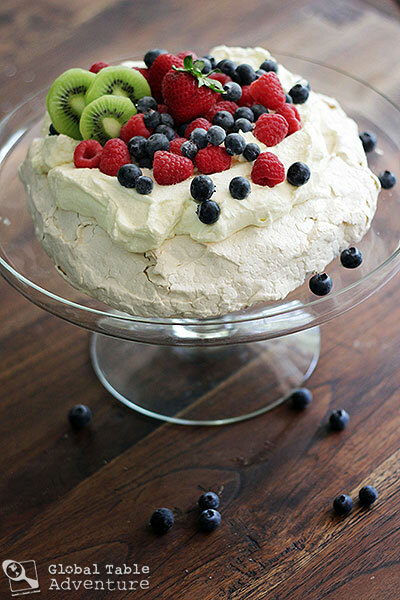 I’m happy to say that I’d eat Pavlova any which way – even if it was invented on the moon. 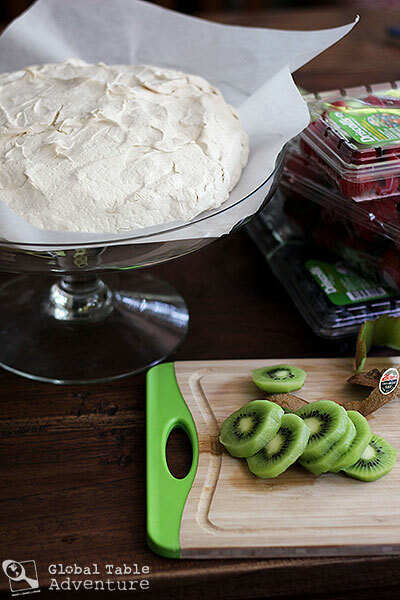 Since we’re making Pavlova in honor of our New Zealander Global Table, we’ll be adding slices of fresh kiwifruit (be careful not to call it kiwi, as that is the state bird as well as a nickname for local New Zealanders). Kiwifruit is a major export of the island nation. P.S. 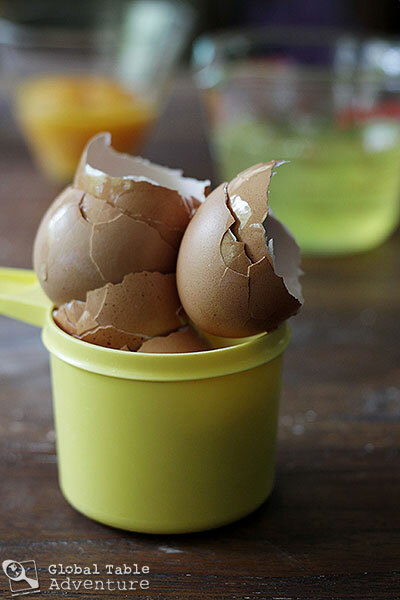 Make this when you need it, to ensure a crackly exterior and soft interior. P.P.S. Make a big pot of hot tea to drink with this. Or coffee. Unsweetened. 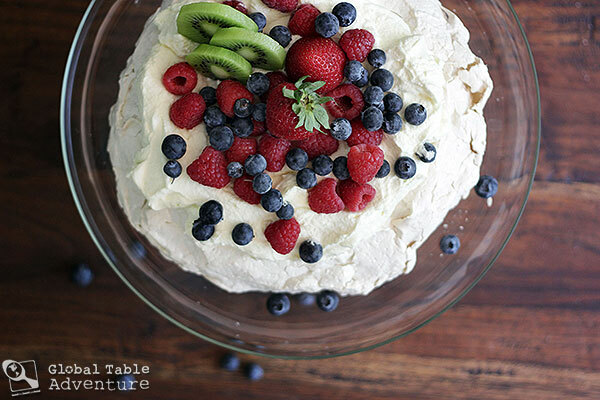 Find a happy spot to make your pavlova. Then trace an 8″ circle on parchment paper and place on baking sheet upside down (so lead doesn’t get into your pavlova). 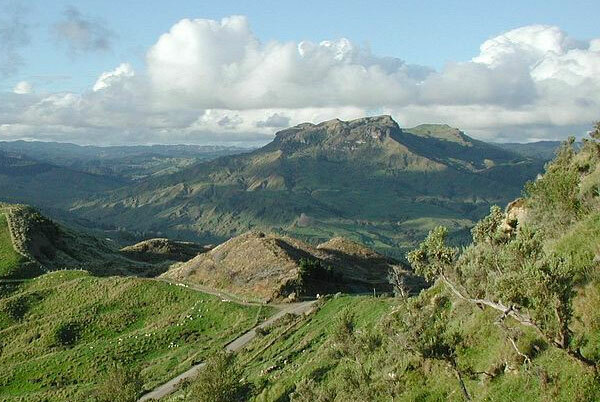 View over mountains and pastureland north of Mahia Peninsula, seen from Mangaone Caves Scenic Reserve. Photo by Pseudopanax. Next up? 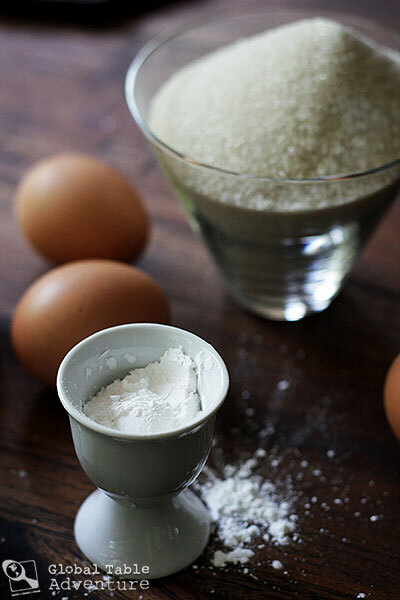 Measure out all ingredients; once you start whipping you’re not going to want to stop. Stir together a flurry of cornstarch and sugar, using the back of a spoon to evenly distribute the cornstarch and break up any pesky lumps. Now we can go ahead and preheat the oven to 250F (it doesn’t take very long to heat up). Meanwhile, whip egg whites to soft peaks. Add the cornstarch mixture, 1 tablespoon at a time, until fully incorporated. Stream in the vinegar and vanilla extract. 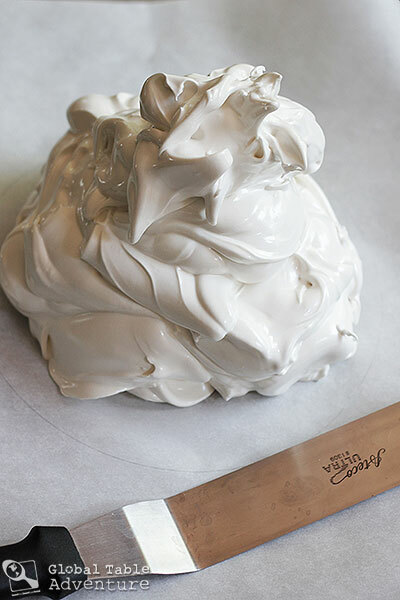 Whip on high 5-7 minutes, or until shiny, stiff peaks form and you almost can’t stop yourself from diving in. 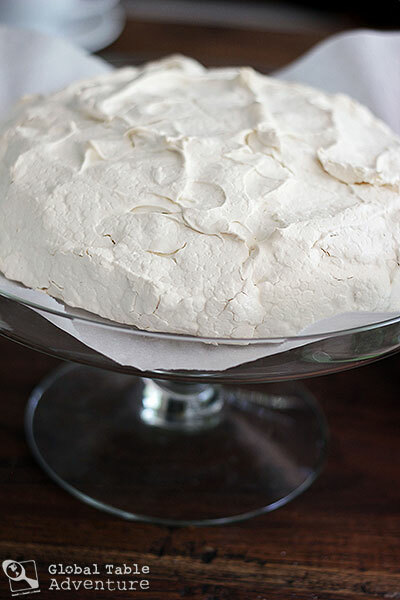 To be quite sure the meringue is done, take a little pinch between your fingers – if it’s gritty, it’s not done. If it feels smooth, you’re all set. I ate more of this than I care to admit. But… it still needs to be baked. 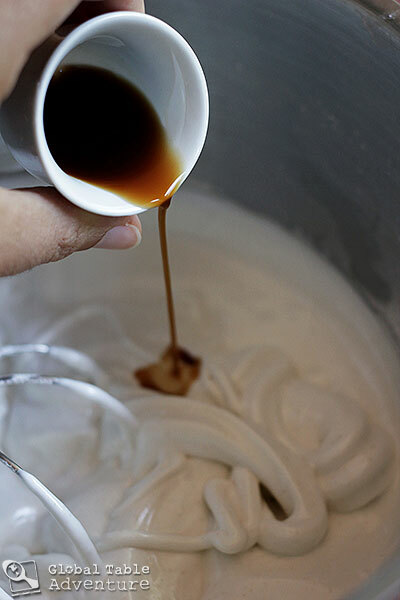 Pile the whipped whites onto the center of your circle. It’ll make quite the mountain. So fun! This is your summer cloud. Bake at 250F for 50 minutes. Reduce heat to 200F and continue cooking another 15 minutes. The pavolov should be white with a shattering crust. There should be no browning or much cracking. 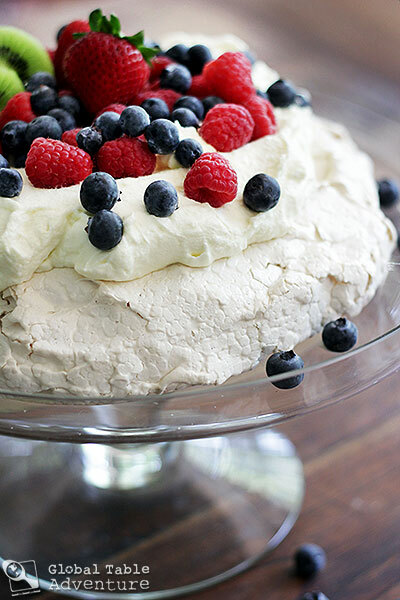 Turn off the heat and let the pavlova cool completely in the oven. No peeking, or the sudden temperature change might cause large cracks to form. While you wait, take a walk along New Zealand’s beautiful countryside. 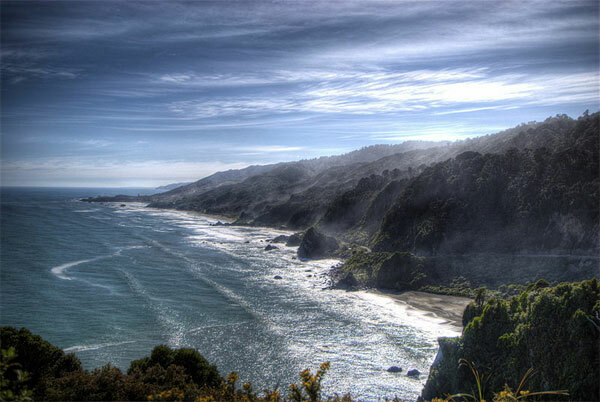 Beach at Punakaiki, New Zealand. Photo by Ville Miettinen. Ahh. When you return, prepare the fruit and whipped cream. Smooth on the whipped cream with a light touch, then pile on the berries (I used 1 cup of whipped cream and I think next time I’d use more because it helps balance the sweet meringue). I let the blueberries fall where they will, but put the kiwi slices straight up, for a little dimension. It’s almost a crime to slice this dreamy dessert… but do it quick, as hot humid days will soften the outside quickly. 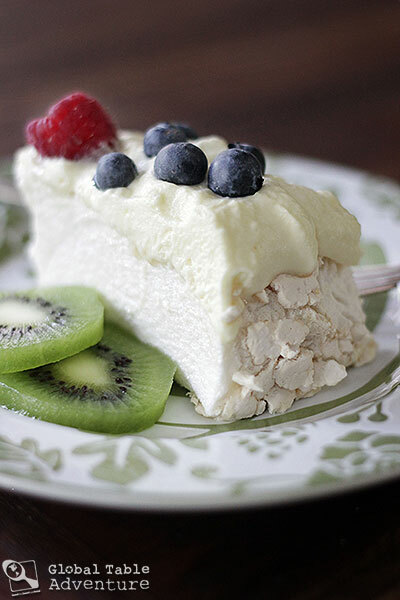 Named after a Russian ballet dancer, this meringue “cake” takes center stage, topped with whipped cream and fresh fruit, like berries, kiwifruit, mango, or even passionfruit. Both New Zealand and Australia lay claim to inventing this famous dessert. 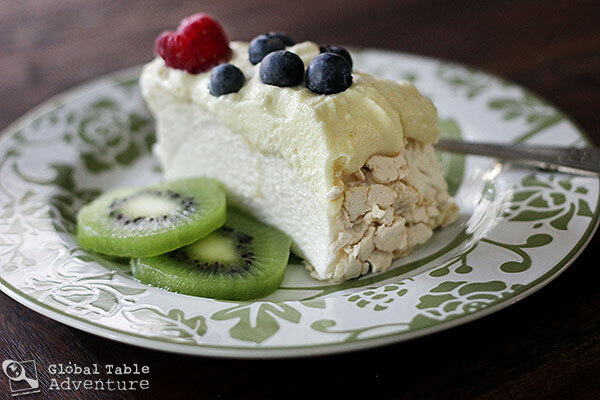 I’m happy to say that I’d eat Pavlova any which way – even if it was invented on the moon.Since we’re making Pavlova in honor of our New Zealander Global Table, we’ll be adding slices of fresh kiwifruit (be careful not to call it kiwi, as that is the state bird as well as a nickname for local New Zealanders). Kiwifruit is a major export of the island nation. 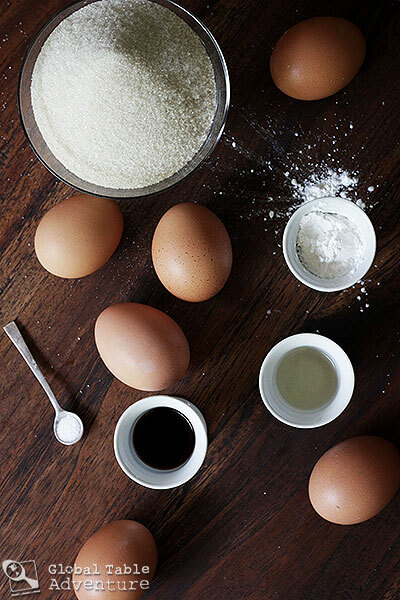 Measure out all ingredients; once you start whipping you’re not going to want to stop. Now we can go ahead and preheat the oven to 250F (it doesn’t take very long to heat up).Meanwhile, whip egg whites to soft peaks. Add the cornstarch mixture, 1 tablespoon at a time, until fully incorporated. Stream in the vinegar and vanilla extract. 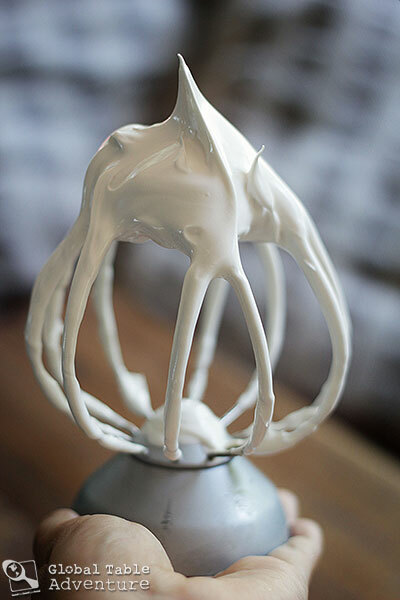 Whip on high 5-7 minutes, or until shiny, stiff peaks form. Bake at 250F for 50 minutes. Reduce heat to 200F and continue cooking another 15 minutes.The pavolov should be white with a shattering crust. There should be no browning or much cracking. 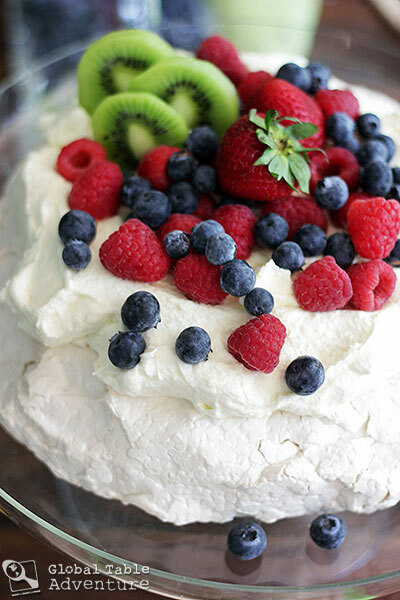 Whip the cream until fluffy and light.Smooth the whipped cream onto the pavlova with a light touch, then pile on the berries (I used 1 cup of whipped cream and I think next time I’d use more because it helps balance the sweet meringue). I let the blueberries fall where they will, but put the kiwi slices straight up, for a little dimension.Enjoy! Looks almost too beautiful to eat, Sasha! Thanks Kate 🙂 Funny you mention grated chocolate – I almost did that. It sounds fabulous. Next time! 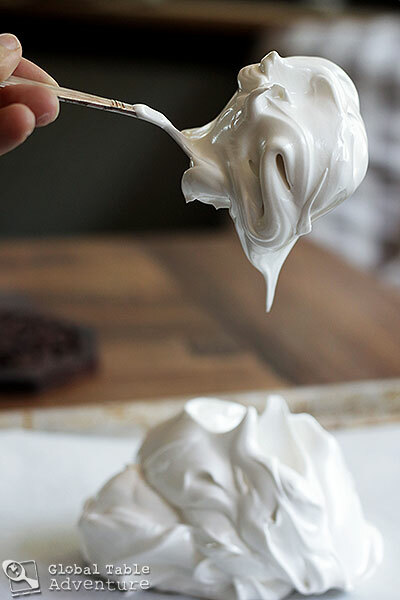 beautiful whipping of your egg whites…that meringue is luxurious! 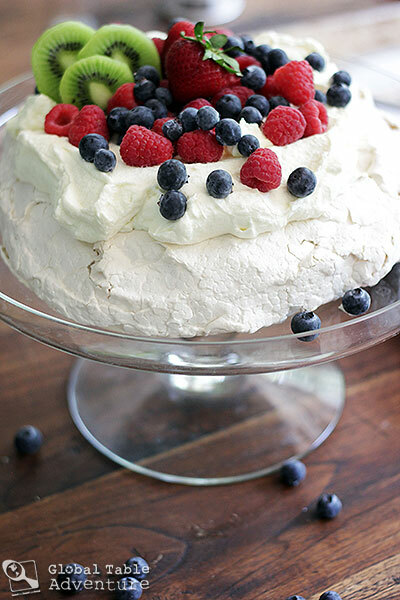 I hardly ever make desserts and only made meringue a couple times (and I love it- just not a habit to make dessert in general), but I have wanted to try pavlova for years. You have now convinced me to do it soon! 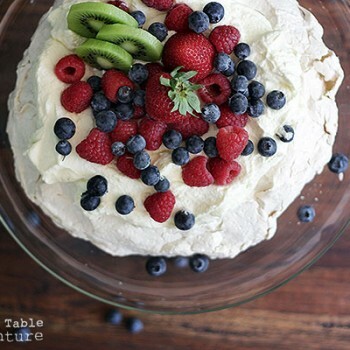 Mmm, pavlova! The first time I had it was when a friend and I made it about a month before I went to NZ. Then while there, I never saw it anywhere! Turns out it’s something people make at home rather than order out. Finally had it at the end of my trip at a hangi in Rotorua. 🙂 Yours is gorgeous! 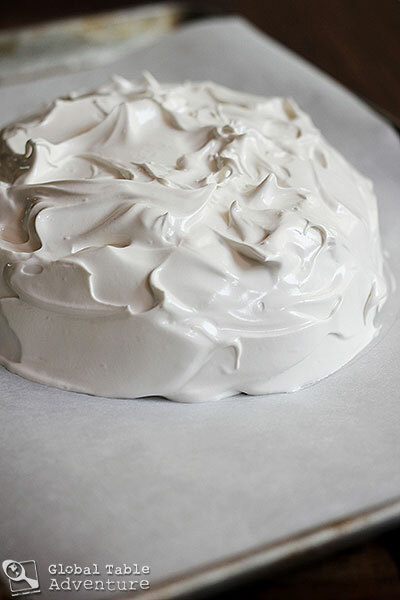 I have a had a couple of bad experiences making meringue, one of which involved a pavlova. I decided to stop trying, but now, seeing your ultra glossy egg whites you convinced me try again. Thanks Nancy! I lifted it off, although it was a bit scary. Might be easier to cut around it, now that you mention it – although the idea didn’t occur to me until you mentioned it haha. it looks wonderful…and difficult to make!